Time and time again clients have told John how much they appreciated seeing the unique and original routines in his act. If you're looking for something different, you've come to the right place. The water routine, scarf dancing routine, marshmallow routine, and plate spinning routine are all guaranteed to delight with their originality, novelty, and comedy. Expect Big Crowds! John Park knows how to draw a big crowd. He started as a street performer on San Francisco's Pier 39. 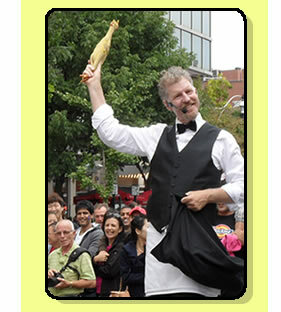 The rule of thumb for street performers: No crowd, no pay. So Park learned quickly how to draw a crowd and keep 'em entertained. Big Impact! John makes a big impact. His six-foot unicycle finale towers over the crowd and can be seen from miles away. 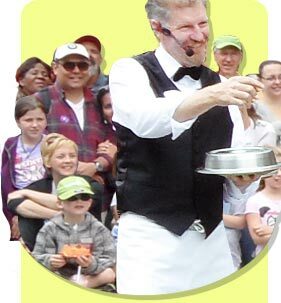 His dynamic plate-spinning finale whips the crowd into a frenzy as they yell to John which plate is most in danger of falling.